When discussing hobbies, the usual suspects tend to include things like building models, solving puzzles, crocheting, and playing cards. While these are all great hobbies, there’s one that’s omitted from this list that’s gained popularity: indoor gardening. Maintaining a garden takes a fair amount of effort and attention to detail; two things that allow the practitioner to feel mentally engaged in the activity. It also promotes mental stimulation and helps maintain cognitive functions longer in life. That aside, the act of gardening is synonymous with relaxing and tranquility; two things most of us could stand to have more of — regardless of age. While the mental benefits are substantial, there are numerous physical benefits as well. It might surprise you to learn that gardening offers just the right kind of low-impact exercise that doctors recommend to seniors in order to maintain a healthy heart and promote muscle growth. Since gardening involves many easy to perform maintenance activities like pruning, weeding, and watering, many different muscle groups are engaged; so it becomes an ideal supplement to bi-weekly aerobic exercise. Low-impact as it may be, gardening can involve a fair amount of bending and twisting, so it’s important that this hobby is still done in a safe way; even light stretching and warm-ups can be recommended beforehand. Older gardeners should be careful to not overexert themselves if they’ve recently experienced a long period of inactivity. A raised plant bed is a safer option; especially where mobility or joint pain is an issue, or when crouching and bending is not ideal. Gardening is a relaxing, even therapeutic activity; but it turns out, there’s some science behind that statement, as well. Therapeutic gardens for the elderly are gaining popularity across the country. There are several reasons for this increase in popularity. According to a study conducted by Bristol University in the United Kingdom, soil contains a bacteria that is shown to trigger the release of serotonin, a chemical produced by the brain that reduces anxiety and improves one’s mood. Simply put, getting your hands dirty by planting and weeding out your garden can make you feel happier. Another study, this one conducted by Johns Hopkins University, found that people who helped maintain a community garden felt a greater sense of belonging and camaraderie with their fellow gardeners. Both of these findings are significant when looking at the impact gardening can have on a person’s mental state. Gardening can be done while chatting with a friend or in mutually-appreciated silence. In other words, gardening is conducive to great conversation, but it also allows a level of bonding without any form of words. For the experienced gardener, this hobby offers the opportunity to not just be social, but to also pass along their knowledge of the subject. Whether it’s with a friend who’s recently discovered a green thumb, a child, or grandchild; gardening allows this type of bonding to occur year-round, despite colder weather. Indoor gardening provides the added benefit of producing, well . . . produce! An avid indoor gardener could supplement, or grow vegetables of their very own; some of which include: lettuce greens, carrots, arugula, kale, scallions, ginger and tomatoes. While all of these plants are chock full of vitamins and minerals, consuming ginger, as an example, is shown to lower the risk of heart disease and stroke, relief from osteoarthritis pain, better digestion and sore throat and cough suppressant. However, even if they aren’t edible, there are many plants that can have a positive impact on life. For example, spider plants, which are fairly easy to care for, help to purify the air, making it ideal for those who may be sensitive to poor air quality. Snake plants are also good to have in the home as they have been found to eliminate toxins in the air. Aloe vera can also be used to treat minor burns and cuts or soothe a sunburn. A lot of active living retirement communities, such as Seasons Retirement, recognize the importance of maintaining your hobbies well into your retirement. With everything considered, indoor gardening might just be one more hobby to add to the list. 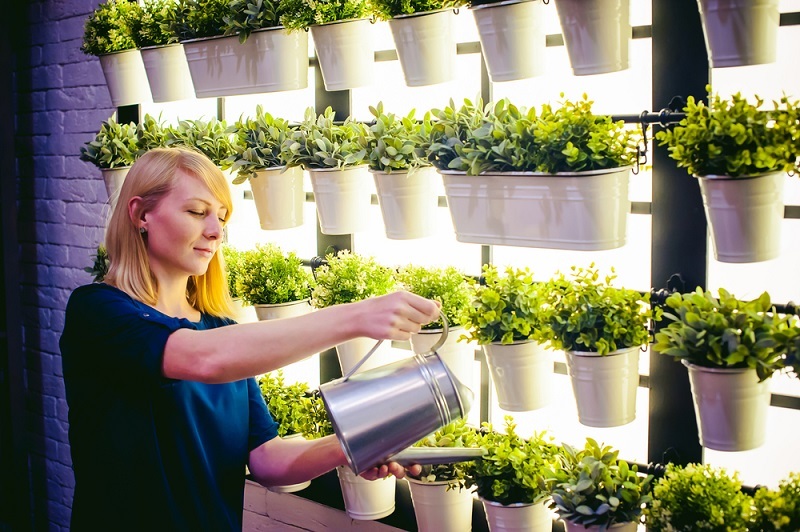 With all of these great benefits, both physical and mental, it’s easy to see why indoor gardening is gaining in popularity. While there are many hobbies out there to choose from, very few of them match the positive impacts inherent in raising a garden, producing herbs, vegetables and food—or allowing a group to build something together. Whether someone with a green thumb, or just green to the experience of gardening, gardening indoors is one to new hobby fresh for the picking.